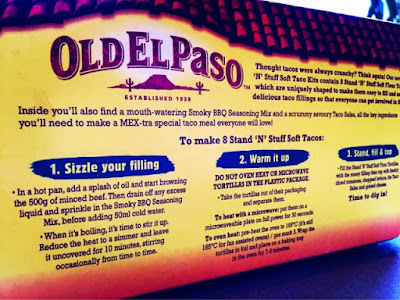 I have to admit I was quite excited to try Old El Paso Stand 'N' Stuff range and see how the whole family would react. 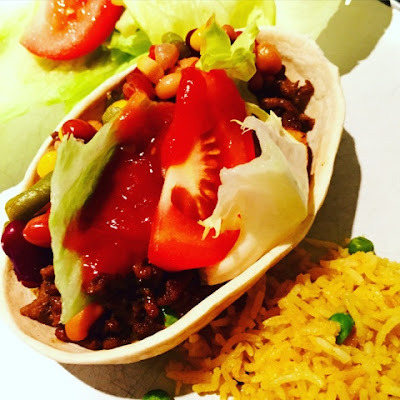 I knew my husband would like them, as we both love Mexican food, and the twins would enjoy the whole food in a taco bowl but I wasn't so sure what the the fussiest eater, Ben aged 6, would think of them. Ben has recently decided he doesn't like minced beef all that much so it was going to be a big test for the Tacos. We were sent the Smoky BBQ Stand 'N' Stuff Soft Taco Kit which contains a seasoning mix, Salsa pack and eight unique flat-bottomed shaped flour tortillas which are perfect for kids as you just stand them on your plate and fill them with your chosen toppings and they are so easy for little hands to pick up and eat with a whole lot less mess! 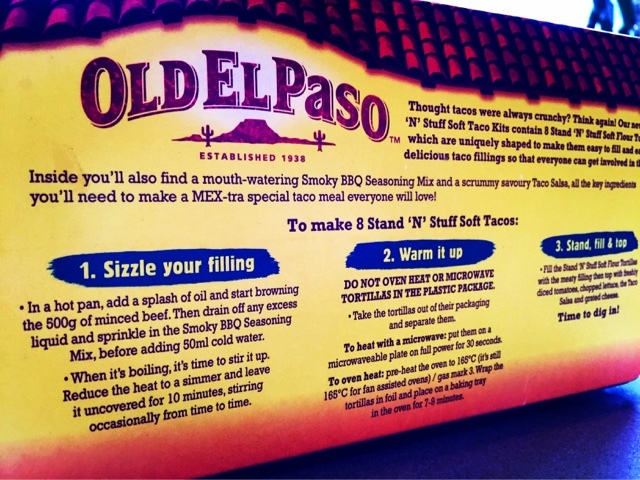 Preparing the Tacos is easy and a great time saver for busy nights. You simply heat up the minced beef, adding peppers or onions if you like - I added peppers. Drain the mince. Add the seasoning, mix it through first and then add 50ml of cold water. Bring to the boil and then leave it to simmer for 10 minutes. If you are heating your tortillas in the over pop them in on a baking tray and cover in foil while the taco mix is simmering or alternatively you can heat them quickly in the microwave. Finally start stuffing your tortillas with your choice of toppings and enjoy! Along with the Taco kit I served a selection of toppings including rice, a mixed bean salad, sliced tomatoes and peppers and grated cheese. Everyone really enjoyed them, Ben asked for seconds which was a salute to how tasty they are, I am delighted I have actually found a minced beef meal Ben will eat without having to tailor and disguise it differently for my little fussy eater. The twins loved their tortilla bowls and asked for spoons to eat some of the filling before munching on the bowl itself which they found amusing. Hubby and I definitely gave them our seal of approval too. They are tasty and a great easy to make week night treat which I will definitely be doing again. 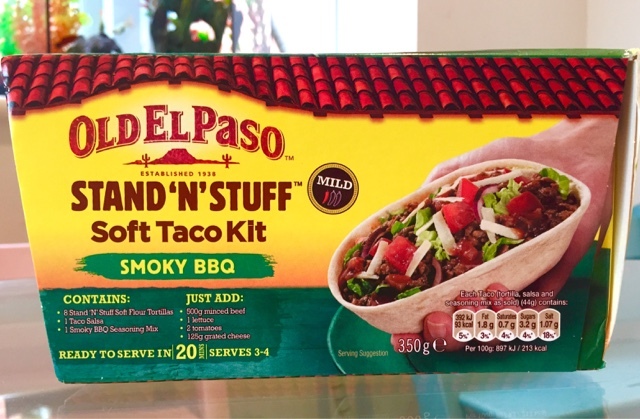 The Taco Kits come in three different varieties including Smoky BBQ, Extra Mild Super Tasty and Garlic and Paprika and are available to purchase from all major supermarkets with an RRP of £3.79. You can also buy the Stand 'N' Stuff Tortillas on their own and these have an RRP of £1.89. *Disclaimer: I was sent the Smoky BBQ Stand 'N' Stuff Soft Taco Kit for free in exchange for a review. All views and opinions are my own and unbiased.